Al-Waha has a huge variety to choose from and their 250 gram jars allow for Hookah users to smoke several times a month or with large groups of friends. This size is packaged in a tub with a secondary inner package that is sealed for freshness. The container is resealable but is not recommended for shisha storage unless you got through it fairly quickly. Otherwise, make sure to store it at room temperature in an airtight container so that it is sure to maintain its freshness. 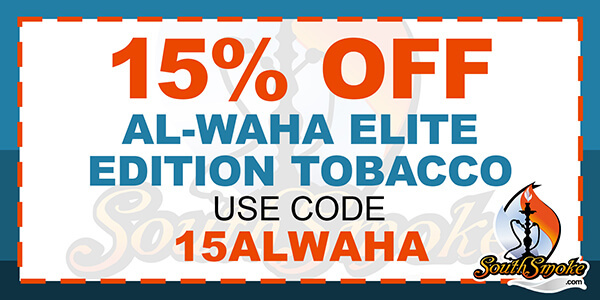 Al-Waha produces the best results when using a normal pack in a phunnel bowl; just sprinkle in the tobacco producing a fluff pack and lightly pat down until all stray leaves are smoothed out and it reaches the edge of the rim. Sight foil contact is fine just don't overdo it and make sure the holes are not too excessive or too large as to not burn the tobacco. You can start hitting it directly after putting on the coals as Al-Waha gets going quick but it is recommended to start with 3 hookah coals depending on the size of the hookah bowl you are using and work your way up if you want more heat; just keep in mind that too much heat can make it turn harsh.